The boy and his father were taken to the El Paso Border Patrol station, where they were held for two days, CBP said. They were later taken to the Alamogordo station. 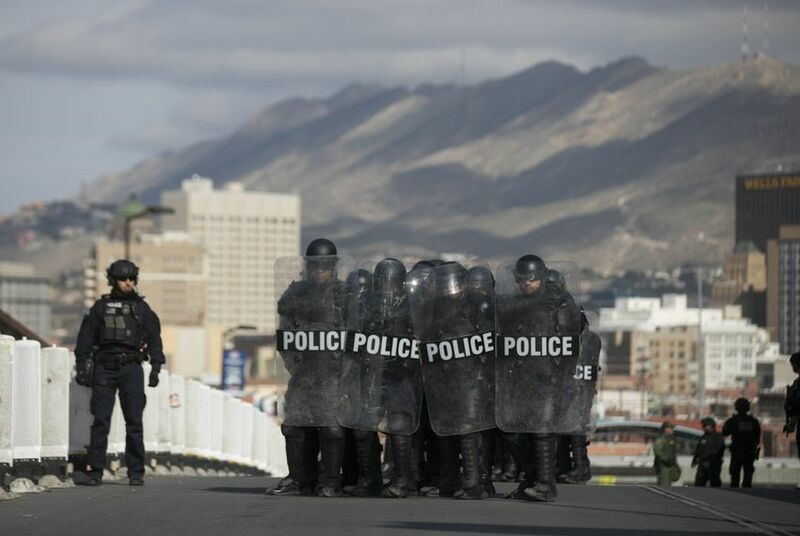 CBP said it was looking into options to relieve overcrowding in its facilities in the El Paso sector, which includes El Paso County and all of New Mexico. An 8-year-old Guatemalan child detained by U.S. Customs and Border Protection died at a hospital in New Mexico, the agency reported Tuesday, the second migrant child to die in government custody this month. CBP Commissioner Kevin K. McAleenan said the Border Patrol would conduct health checks of all children in its “care and custody,” whether they arrived in the United States as part of a family or were unaccompanied. The health reviews will focus on children under 10. The new statement did not say how many children would be assessed, but they could number in the thousands. CBP also said it was looking into a variety of options to relieve overcrowding in its facilities in the El Paso sector, which includes El Paso County in far western Texas and all of New Mexico. The child’s death came 17 days after 7-year-old Jakelin Caal, another Guatemalan national, died Dec. 8 of dehydration and shock less than 36 hours after she was apprehended by border agents. The most recent death highlighted the stalemate over President Trump’s demand that Congress approve additional money for a wall along the U.S. border with Mexico, a standoff that has shut down parts of the federal government for four days. Trump said again Tuesday that there will be no change until his demands are met. About 25 percent of the government has been shut down since midnight Friday. The president defended his call for $5 billion to construct a wall along the border with Mexico, saying that only an Olympic athlete would be able to scale such a structure. “If you don’t have that, then we’re just not opening,” Trump said. All told, about 800,000 of the 2.1 million federal workers nationwide — or more than a third — are estimated to be affected in some way by the shutdown. Trump claimed that many government employees support the shutdown. But his claim conflicted with accounts from the workers’ union leaders. He became lethargic about 10 p.m. and was taken back to the hospital. On the way, he began to vomit again and lost consciousness. Doctors were unable to revive him at the hospital, and he was declared dead at 12 minutes to midnight. The cause of death is not known. An autopsy is planned. “This is a tragic loss. On behalf of U.S. Customs and Border Protection, our deepest sympathies go out to the family,” McAleenan said. An investigation into CBP actions will be conducted by the agency’s Office of Professional Responsibility, the CBP news release said. The Department of Homeland Security’s inspector general and Congress have been notified, it said. The Guatemalan government was notified, and the father has met with consular officials at the Alamogordo station, CBP said. He also has spoken with his wife in Guatemala, the agency said. Under guidelines established after the government waited several days to inform Congress about Jakelin Caal’s death, CBP agreed to notify lawmakers within 24 hours of a death of anyone in its custody and issue a media statement an hour after that. Notifications also must be issued to nongovernmental organizations that work with migrants and others. U.S. Rep. Lucille Roybal-Allard of California, the ranking Democrat on the Homeland Security appropriations subcommittee, said in an interview that “the reality is that a detention center is no place for a child, particularly a sick child. When that child was determined to be ill, had a 103-degree fever, why they would send that child back to a detention center, which is really not fit for even a well child? Ruby Powers, a Houston-based lawyer and member of the American Immigration Lawyers Association, said the boy’s death is not unexpected given the difficult conditions that immigrants and their children face on the journey north to the United States and the way authorities shuttle families between facilities. CBP said in its statement that it is developing “surge options” with Immigration and Customs Enforcement aimed at getting more families and children out of CBP custody in the El Paso Border Patrol sector. That includes working with nongovernmental organizations to house children and families. The El Paso sector has seen a huge increase in the numbers of families arriving and seeking asylum. Annunciation House, a nonprofit that provides shelter and food for migrants after their release by ICE, has been overwhelmed in recent days. ICE released more than 200 people at an El Paso bus station without warning on Sunday. Similar numbers were released Monday and Tuesday, and hundreds more are expected Wednesday and Thursday officials have said. CBP also said it is seeking medical help from the Defense Department and other agencies for the large numbers of children and families in custody. The agency said it is reviewing its policies for caring for children under 10, including at intake and when they are held for more than 24 hours. Court orders prevent CBP from holding children for more than 72 hours. But officials have acknowledged that they sometimes move children from one holding facility to another to avoid going over the 72-hour limit. The child who died in Alamogordo had been held by CBP for more than 130 hours before he died. Jakelin’s family has disputed CBP reports that the child went several days without food and water before she died, saying she was healthy when she arrived in the United States. In a news conference earlier this month, a migrant advocate said the girl’s father, 29-year-old Nery Caal, had told him that Jakelin was healthy and had no preexisting conditions. “He’s been very clear, very consistent that his daughter was healthy, and his daughter very much wanted to come with him,” said Ruben Garcia, founder and executive director of Annunciation House, an El Paso-based nonprofit that helps migrants. The symptoms the 8-year-old boy exhibited are similar to the ones Jakelin showed before she died. More than a day before she died, Jakelin, her father and 161 other Central American migrants crossed the U.S. border outside Antelope Wells, N.M., seeking to turn themselves in to Border Patrol agents. The Department of Homeland Security has said that the girl did not show signs of health problems during a routine check conducted when she and her father were taken into custody. “The initial screening revealed no evidence of health issues. During the screening, the father denied that either he or his daughter were ill. This denial was recorded on Form I-779 signed by the father,” the DHS account said. It added that they were offered food and water and had access to restrooms. The form was in English, but CBP officials said agents provided an oral translation. The family’s attorneys have said that it was “unacceptable” to have Jakelin’s father sign a document in a language that he did not understand. Jakelin’s body was returned to Guatemala on Monday. Moore reported from El Paso. Paul Schwartzman and Elyse Samuels in Washington contributed to this report.